Background: Autism challenges traditional parenting styles, and can make parents feel deskilled and disempowered, especially if little information or support is available to them. Providing accurate information about autism to parents, and teaching them to adapt their parenting using good autism practice has been shown to be effective in improving personal, educational and social outcomes for individuals with autism and their families (Bearss et al 2015, Farmer and Reupert 2013). However, such support is extremely limited or non-existent within some south-east European countries. Objectives: A three-year European Union-funded project has been established involving family members, professionals and academics. Its objectives are to develop a core parent autism education curriculum and locally appropriate parent education materials and methods; to provide parent education in three diverse south-eastern European countries (Croatia, Cyprus and the Former Yugoslav Republic of Macedonia) where diagnosis and service provision are emergent; to develop local parent education teams within these countries to ensure sustainability; and to evaluate the impact of the parent education events upon families attending. Methods: After reviewing the literature and surveying parental priorities in the three countries, a 12-hour parent education programme and locally differentiated training materials were developed. In total, five cohorts of approximately 20 parents each will receive parent education within each of the three countries. A combined process and outcome mixed methods evaluation methodology (Royse et al 2009) is being used to evaluate the project. Data are gathered via pre-attendance, post-attendance and follow-up (3-month) parent questionnaires – incorporating the CarerQoL quality of life scale (Hoefman et al 2014) – from all participants, semi-structured interviews with a purposive sample of parents, trainer focus groups and reflective diaries, and document analysis. We here report on quantitative (n = 108) and qualitative data (n = 20) from parent cohorts 1 and 2. Results: Quantitative data identify that >90% of respondents have improved their understanding of autism, >80% report improved child communication and >75% report improvements in overall family life, their ability to predict their child’s behaviour and their ability to respond to concerns and comments from the broader family. Carer QoL data indicate increased parental happiness following attendance (p=.001). Key themes from qualitative data are the positive impact of attending the parent education programme, increased awareness regarding sensory and communication issues and improvements in everyday life. Parents also reported that attendance provided opportunities to meet other parents and reduced social isolation. Conclusions: Data from parent cohorts 1 and 2 identify that parents who have attended the parent education programme have found it beneficial, and that it has had a positive impact on their family life. Key areas of impact have been improvements in communication and improved management of sensory and behavioural issues. This supports the continued and wider provision of parent education within these countries. Further data from cohorts 3 and 4 will have been collected and analysed by the time of INSAR 2018. Relevance: Clinical heterogeneity among children with neurodevelopmental disorders reflects diversity in strengths and needs that can have important implications for therapeutic management. Autism Spectrum Disorder (ASD) is sometimes a co-occurring associated condition of cerebral palsy. Whereas cerebral palsy affects motor functioning, autism affects certain areas of brain development. Cerebral palsy (CP) is primarily a motor disorder, caused by a cerebral lesion occurring in the developing brain. Purpose: To explore autism spectrum symptoms in children with cerebral palsy (CP), and the association between autism spectrum symptoms and medical and psychiatric co-morbidity. judgement. The assessment of ASD in the face of CP should entail a detailed history, examination and structured observation of the child’s social and communication skills, complemented with standardized diagnostic instruments which are validated for children with motor difficulties. Both conditions are discovered at roughly the same age, usually. Cerebral palsy is usually discovered a little earlier, at perhaps 6 months to 2 years of age. Autism is discovered a little later, usually by 5 years of age. They are highly variable, with some symptoms present in some children but not others. Both conditions can be very severe or hardly noticeable. 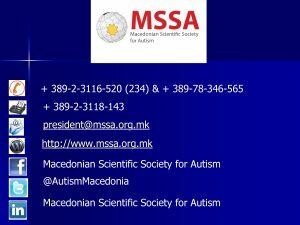 Conclusions: A holistic approach is required when evaluating a child who demonstrates impairments in social communication skills in the presence of motor impairment More attention should be given to autism spectrum symptoms in the regular follow-up of children with CP in an attempt to enhance social functioning. Key words: cerebral palsy, autism spectrum disorders, neurodevelopmental disorders.